There are two named tropical systems in the Atlantic with a possible third on the way, and two named hurricanes are headed for Hawaii in the Pacific. That's a possibility of five different storms to keep track of — Hermine, Gaston, Madeline, Lester and maybe Ian. This is the exact reason why we started naming storm systems in the first place. 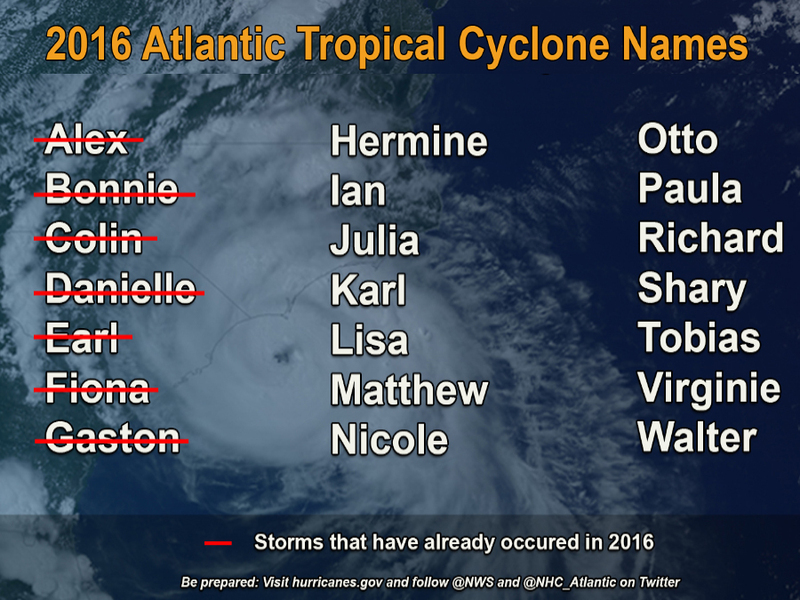 Naming these tropical systems makes it a lot easier for the general public to keep track of any impending weather that may affect them. The naming system we currently use has been in effect since 1979 — alternating men and women's names through the alphabet except for the letters Q, U, X, Y and Z. We have six different lists that rotate every six years, and names are retired when a storm becomes large enough or causes a significant amount of damage to life and property.